Want to spy on an Android phone? There is an app built for that and it is called Xnspy. It is one of the popular Android spying apps that possess advanced spying features which have made spying on another device easier than expected. Using this app, you can spy on text messages, call logs, Instant Messenger chats, emails, browsing history and even track the location of another Android device. This spying app is compatible with Android Oreo too. It has two versions; Basic and Premium. The price of the Basic Version starts from $8.33 a month and that of the premium Version starts from $12.49 a month. There is so much you can do with Xnspy which is also a keylogger app for Android phones. 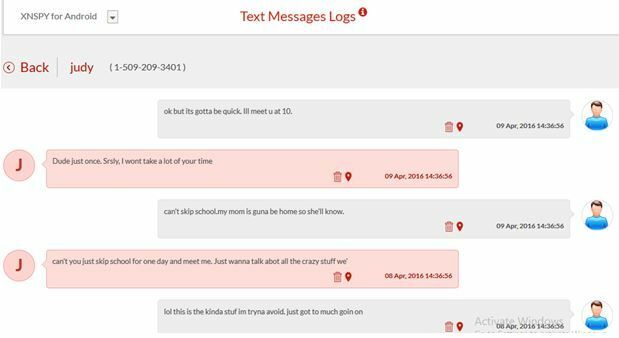 If you can want spy on the text messages of another person using Xnspy, read further. How to subscribe to Xnspy? Subscribing is simple. 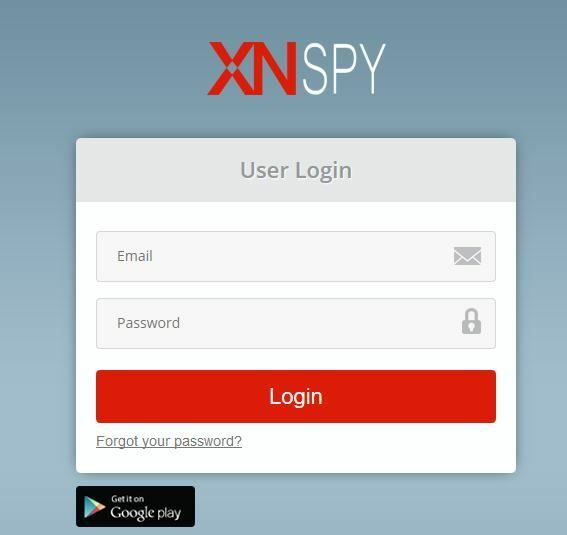 Just visit Xnspy’s official website and click on ‘Buy Now.’ Choose the edition you like (either Basic or Premium), make the payment and you will receive a download link to the app, activation code and credentials to your Xnspy web account in an email. Follow the instructions given to install this Android spy app on the target phone (The Android phone which you want to spy on). Remember, you are going to need physical access to the target phone to install the app. Successfully subscribed and installed Xnspy on the target phone? Great! Note that you cannot start spying on another phone right after installing this Android spy app. It needs almost 24 hours to extract data from the target phone and display it on your dashboard. You will land on a dashboard that will look something like this. You will see a graph displaying calls and text ratio throughout the week, last known location and recent text messages on the screen. From the dashboard menu on your left, choose ‘Phone Logs’ and a drop-down menu will appear. 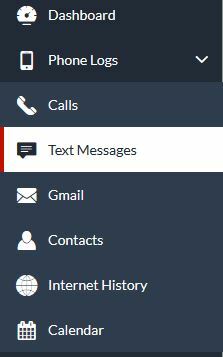 Now choose ‘Text Messages’ and a text message log will open in a new website beside the menu. 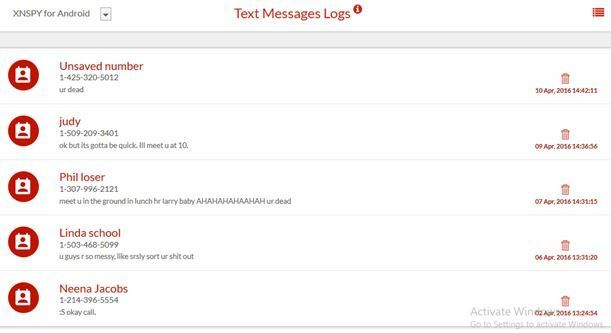 In this log, you will see contact names and their chat threads. To view details of the conversation, click on the desired contact and you will get to see all sent and received messages along with their time and date stamps. The phone number of the contact will also be displayed right beside their name. The great thing about this Android spy app is that even if the target device owner deletes a message, you will still get to see it on your dashboard as long as Xnspy creates a backup. Nothing will be hidden from you! By following the similar procedure, you can spy on anything on another Android phone. You just have to navigate through the dashboard menu to find what you are looking for. 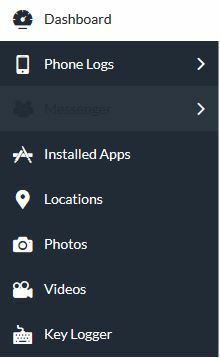 For instance, if you want to spy on the keystrokes, just choose ‘Keylogger’ from the dashboard menu and this keylogger App for Android will show you all keystrokes entered by the target user on Facebook, Facebook Messenger, WhatsApp, Viber, and Skype.